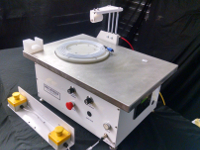 Custom table top plastic tubing coiling machines for specialty processes. 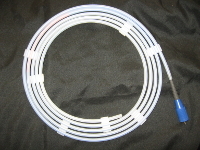 Will coil flat coils, smaller diameter tubing sets and single pieces of tubing. Automatic counter for number of turns, mandrels drop to easily remove tubing. 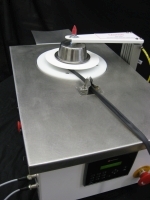 Makes pancake style coils. 1. Feed motor starts and feeds product into pins. A timed sequence. 2. Slow speed start for 1 revolution to grab tubing, then table goes to winding speed. 3. Table slows down as the counter gets close to preset count. 4. Table stops when preset is made, cutter is activated, counter is reset. 5. 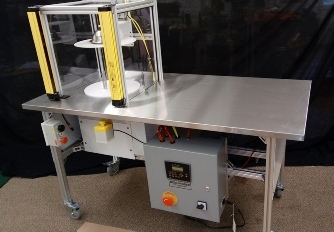 Table makes one revolution, pins retract, retrieve coil and either press to start or auto start to repeat the process. Custom plastic tubing coiling machines with traversing mechanism to make military style coils. 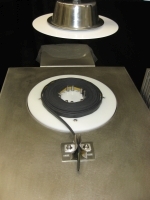 Can coil on a reel, or can coil without reel so that the finished coil can be placed into a box. Automatic counter for number of turns, Makes military style coils. 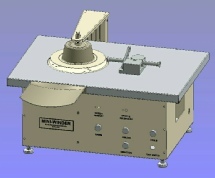 Flat coil machine to make clipped dispensers for coiled guidewire and catheter dispensers. Machine will coil stiff plastic tubing, the operator then manually places the clips (connectors) onto the coil to hold the shape of the coil and the machine coils the plastic tubing. Please contact us for details and pricing information. These machines will be made for your specific application.